Every once in a while you come across a product so brilliant that you just think to yourself - this is amazing, I should have thought of that! Well the Kiinde Twist Starter Kit is one of those products. I was sent this product to try a few weeks ago, and it was darn good timing too! I was preparing to haul the breast pump out to try the little lady on a bottle, in readiness for a wedding that we went to over the weekend. I always find the whole expressing, pump, bottle scenario a tad tedious, so a product promising to simplify this was just up my alley. So what is the Kiinde Twist Starter Kit you ask? Well in a nutshell it is breastmilk storage system designed to take the hard work out of collecting, storing, organising, preparing and feeding your breastmilk. Quite simply, they have developed a 'pouch' that is designed to twist on with most major breaspumps on the market. I have a Medela Swing Pump and it fits like a dream. Instead of messing about with bottles, pouches and then bottles again, you simply hook the pouch up to your pump, express away and then pop in to your organising unit in the fridge or freezer. When it comes time to use up your milk, there is no need to mess about pouring back in to bottles. No, no. 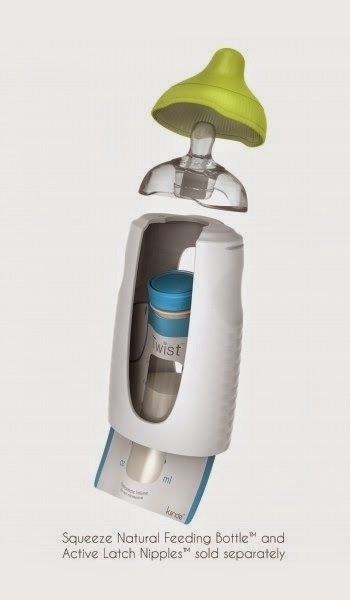 All you need to do is simply snap the pouch directly on to their specially made feeding bottles and away you go - simple! This unit would be brilliant for those that express regularly, or have returned back to work but continue to express to feed their little ones while away. This product is new here is Australia and you can check it out at these retailers across the country. What baby or toddler products could you not live without? I absolutely love my Medela Swing Pump, my baby swing and the Wiggles DVD's are a real saviour at the moment!! !